Private training details may be found at the bottom of this page! 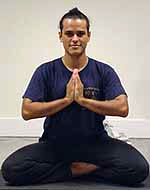 Santiago Dobles has over 20 years of training and experience in tantric yogas and meditation. He has been teaching yoga and conducting seminars in Miami since 1997. He was certified in 1996 to teach Tantric yogas and ayurvedic yoga therapy and conduct teacher training by Trika institute of Boston. He trained directly under Dinu Roman, tantric scholar and yogi. Santiago is the founder of The Dobles Institute of Yoga, Qigong, and Pencak Silat, and was co-founder of UMAA Tantra, an organization dedicated to the research and study of authentic Yogic practices and philosophies. 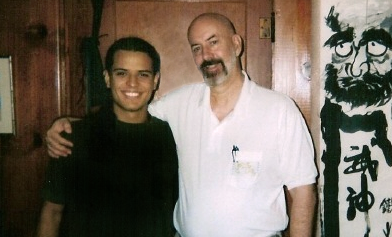 He has also trained extensively in HoshinTao ChiKung (Qi Gong) and Hoshinjutsu with the late Dr. Glenn Morris. He is a certified HoshinTao ChiKung (Qi Gong) Instructor and Kundalini Awakening Process (KAP) instructor under Dr. Morris. Santiago practices Qi Gong healing, Reiki, and Pranic healing. He is a certified Reiki Master. Also he is certified in Aromatherapy and Herbalism in Complementary and Alternative Medicine by Miguel Cisneros-Abreu/ A-CAM. He is a practitioner of the Tibetan Bon Po tradition and Tibetan Nyingma traditions. He has also received numerous empowerments from various Tibetan Lamas in Mahayana Buddhism, Dzogchen, Tantra Yoga, Tibetan Yoga (Tsal Lung Trul Khor), Meditation and Shamanic Tantric healing. Santiago has extensively researched Jun Fan Gung Fu, Jeet Kune Do, Wing Chun, Kali Escrima-Kuntao, Pukulan Pencak Silat, Muay Thai Kick boxing, Hoshinjutsu, and Martial Qi gong. He began his training in 1999 under Sifu Dwight Woods of Unified Martial Art Academy. Since then he has trained with Bruce Lee’s protege and martial art legend Guru Dan Inosanto, Muay Thai legend Arjarn Chai Sirisute, Sifu Tim Tackett, Sensie Erik Paulson, Professor Salem Assli, Samuel Kwok, Dr. Glenn Morris, William Dethouars. He attended and trained an invitation-only Wing Chun instructor-level course with Sifu Francis Fong in addition to numerous wing chun seminars. He also has attened various seminars with Sifu John Bracy in Internal martial arts (Bagua, Yi Chaun, Qi Gong). And studied traditional Serak with Guru Stevan Plink. He has studied one-on-one intensively with Guru Cliff Stewart and continues to study with him (L.A.Silat) Pukulan Pentjak Silat Sera/Bukti Negara, Kilat, and Silat Tuo, W.A.R. His martial art background and effectiveness of Pencak Silat has been put to the test with real world experience over the last year as he worked in the field of Executive Protection & Bodyguarding. He has protected clients such as Rapper Jay-Z and has done body guard work for various private organizations in South Florida. Santiago is also an acclaimed guitarist and producer, with numerous guitar magazine appearances and equipment endorsements. His band is Aghora. He lives with his wife Ingrid, their children, their dog, two cats, and two slider turtles, in sunny Miami, FL. Santiago’s skype id: silatyogi (you will need to download skype; it’s free. 1 hour Skype Video Call Training: Coaching sessions to train specific aspects of KAP 1, 2, PSD or any CHI KUNG related training. Cost $100. Email sdobles @gmail .com (remove spaces) to schedule a session. Response time may be several days if Santiago’s TV sound production work is running overtime or if he is touring with his music.